Here are pictures of the antebellum church and cemetery that my grandfather (Daddy's father) took at the funeral. This is my maternal grandmother's family church and cemetery in Florence, SC. We loved going with Ma every Easter and Christmas to put flowers on the graves. Ma would always point to her father's grave (George Webb Waring) and say, "Daddy's spinning down there knowing he was buried in an Episcopal cemetery!" Thank you all so much for the wonderful outpouring of support for our family! The notes, gifts, flowers, food, prayers, and unfeigned love have meant the world to us. The funeral service went very well and we all held up. When I set out to give my eulogy, I lugged a family-sized box of tissue, my notes, and a water bottle up to the podium. I know I must have looked like a dopey donkey schlepping all my stuff, but as I looked over at Webb's body while Bill was speaking, I figured I better go prepared, and I'm glad I did! Once I got up there, and I could see Webb out of my peripheral vision, it occurred to me that he was finally wearing big boy underpants, paired with his eldest brother Will's tie. Instantly, my mouth went desert-dry and it would have been impossible to maneuver it without water. Unfortunately, there were no cups or straws (women should never drink from cans or bottles) so I had to swig off that Dasani like a hillbilly on a jug of moonshine. But I made it! I made it through to pay tribute to my delightful little boy- our beloved gift from God. The younger children have amazed me with their effortless acceptance of the Lord's judgment concerning Webb. George swung his bent elbow over the side of the casket as if Webb were merely in a sandbox, and he might just crawl in with him to get in one last wrestle. When I asked Richard if he wanted to touch Webb's body, he chirped, "I think I will take a little poke." And he gently poked Webb as brothers are wont to do. I guess I expected them to be more distraught because, frankly, I've never known siblings as close as these children, and I'm not exaggerating or boasting because they're my kids. I can honestly say I have never witnessed a family with children who long for each others' company, or are as intimately involved in each others' lives. With Webb at the center of the family, being the weakest and neediest, and since they were all involved in his therapy and play and every little thing about him, you'd think the blow would have crushed them. Perhaps the smooth adjustment has somewhat to do with being free from any guilt or regret mixed in with grief. They all know they served and loved Webb par excellence. They also know they lifted Webb in prayer constantly, trusting the Lord to help. We were devout in our prayers after Bible time in the morning, and he was also mentioned for this and that at most mealtime prayers. I'm the only one who still cries daily, but that's not because I'm resisting the Lord's decision, it's simply because I'm a momma who misses her adorable, vulnerable, Tiny Tim. I miss smooching up those magnificent cheeks. I devoured him with rapid-fire machine gun kisses on those fab'uh'lous jowls each and every day, and now I just don't know what to do with myself. Writing thank you notes has been wonderful because I get to rehearse for others our deep gratitude to the Lord for thirteen awesome years, and invite folks to come to the website to see the video Sarah Grace made with Webb last November. Even though Webb wasn't up to baseline after his bout with H1N1, that video shows his endearing personality, albeit slower than usual. The video doesn't make me cry. It makes me burst with pride, and floods my soul with happiness. Again, thank you all so much for your loving benevolence. Our hearts have taken note, and we thank God for you. I want to thank everyone for coming to Florence today, as we celebrate the life of our treasured son Webb. Words are inadequate to describe the pain and grief that the family has experienced over the past three days since our amazing son Webb passed away on Wednesday. Although our faith in Jesus Christ is sustaining us during this time, we terribly miss our incredible thirteen-year-old son and brother who has preceded the rest of us to heaven. And though we mourn our loss, we want to celebrate and honor his life today, because we are so thankful that God gave him to us for thirteen wonderful years, and we will be forever grateful to Him for giving us Webb. Heavenly Father, we thank you for the family and friends that have gathered here to honor the memory of Webb. We thank you for your Son Jesus Christ, and for sending your Holy Spirit, the Comforter. Holy Spirit, please provide your supernatural comfort to those here today, as we remember the marvelous blessing that Webb was in our lives, and take comfort in knowing he is finally able to walk and talk, and is completely whole. Be with us today, as we share memories of Webb and honor him for the unique and exceptional member of the family that he was. And in all of this, we give you praise and glory, in the name of Jesus. Amen. How can I possibly condense thirteen years of memories such that I can adequately share with you the remarkable young man known alternatively as: Webb, Webbsite, Webbo, Bobo, Momo, Sir Cutie Bobsquinch, and one of my favorites, Webber Dimplehocks? As you probably know by now, Webb didn’t walk or talk. But he more than made up for that lack with having an endearing personality that made everyone melt. We had a ball playing around together. He could crawl around the house like nobody’s business. And he loved it when I would chase him around and tackle him. And sometimes when there would be a show on, he would crawl over to my chair, raise his long arms, and want me to put him in my lap. Several years back he learned how to give the most special kisses in the world, ones that I will treasure for the rest of my life. I could certainly go on and on, and never exhaust the memories of Webb that I could share with you. Webb was a blessing and a joy. We will think about him every day, and we will miss him until we see him again. No son or brother was ever more loved and adored. He was our darling, and he was beautiful. We thank the Lord for thirteen wonderful years. We can't wait to hold him in our arms again. First of all, I want to thank you for coming all this way and allowing us to brag on our treasure, Webb, and tell our story. Webb. He of the most kissable Ricky Nelson lips. My chubsy wubsy cheeks. Mr. Muchos Smoochos. Two days ago I couldn’t even say those words without falling apart, and look at me now. By way of background, I knew when Webb was born that something was amiss, but the doctors tried to convince me that I was imagining it. In fact, I was so sure there was an issue that I took him back to the doctor before his one month appointment, only to be told I was an overly anxious new mom. Eventually, when Webb’s development was clearly proven to be delayed, the doctors finally caught up to me. But, I had long since moved on to the Lord with this trial, because by this time I also knew the doctors wouldn’t have anything in their black bags for us anyway. And this is where my marvelous story begins. You see, prior to Webb’s birth, I loved the Lord and considered myself to be a Christian. I taught Sunday school and did do-goody deeds and all, but I had not yet gone all the way with the Lord. And he says don’t even bother to pack your bags if you’re not planning on going ALL the way. I knew I hadn’t gone all the way because I knew I wasn’t thoroughly minding him. I wasn’t in gross sin, but I knew I still had ambition and pride of life lurking in me… albeit Christian-y ambition, it was ambition nonetheless. You know, like I’m suf-fer-ing for the Lord here in Uganda, or whatever. I wanted to be perceived as spiritual! I had prayed the sinner’s prayer way back in 5th grade, for crying out loud. I was a Greek and Hebrew scholar. I wanted to be admired by the so-called church. I really did love the Lord, but I was blind to how I was actually competitive, in a way, within Christendom. I certainly didn’t want to be hated and despised and falsely accused and mocked and all those things the Lord promises for those who follow him. I wanted to be popular! I was religious, and Lord knows I had all the clichés and deeds of that, but I wasn’t spiritual. Then in March of 1997, following Webb’s birth in January, I became overwhelmed with my fears for Webb’s well-being and fears for my own condition. I was under heavy conviction. I felt like a pinball every time I read the Bible as I kept bumping into verses about how we ought to be living holy and blameless lives: “be ye holy even as your father in heaven is holy,” “go and sin no more,” “walk even as Christ walked,” “if you love me you’ll obey me.” The Bible didn’t say TRY to be these things. One thing I knew from my studies is that there is a word in the Greek for “try” and the Lord did not use it. Many of the denominations have made an occupation of preaching how the Bible doesn’t mean exactly what it says, but the Lord knows how to choose his words. I especially choked on the verse about how with EVERY temptation he gives us a way of escape… so why wasn’t I always taking the way of escape? Well, I hadn’t yet gotten the new birth-- I was still sold under sin. I wasn’t yet a slave to righteousness. I’d bought into the false doctrine of “Christians can’t quit sinning,” or “Christians sin every day.” Anyone who says that has not yet received the new birth. I knew Jesus said his sheep hear his voice. I knew I wasn’t hearing his voice. Oh, I had warm fuzzy feelings and thoughts that I attributed to the Lord, but deep down I knew I was an imposter. The ultimate stumbling block for me, the one that brought me to the new birth, was 1 John chapter 3. 7 Dear children, don’t let anyone deceive you about this: When people do what is right, it shows that they are righteous, even as Christ is righteous. 8 But when people keep on sinning, it shows that they belong to the devil, who has been sinning since the beginning. But the Son of God came to destroy the works of the devil. 9 Those who have been born into God’s family do not commit sin, because God’s life is in them. So they can’t keep on sinning, because they are children of God. 10 So now we can tell who are children of God and who are children of the devil. Anyone who does not live righteously and does not love other believers does not belong to God. 11 This is the message you have heard from the beginning: We should love one another. 12 We must not be like Cain, who belonged to the evil one and killed his brother. And why did he kill him? Because Cain had been doing what was evil, and his brother had been doing what was righteous. 13 So don’t be surprised, dear brothers and sisters, if the world hates you. I stumbled over those verses for a long time but I finally understood what it all meant when I went to the Lord toting my Webb under one arm and all my sins and my sin nature under the other and totally gave it all to him, giving up my rights to my entire life and even my next sin. And thus began my magnificent obsession with the Lord Jesus Christ. I found out that you have to repent first before you can believe. This is one of the great mysteries of the Gospel. Jesus said repent and then believe, in that order. The Word of God is spiritually discerned. It can’t be understood without the new heart. For all my Bible studies, I never really understood the scriptures until after I repented. I couldn’t fully see the truth until after I got my new heart. I got hated right quick, losing friends and family. I almost lost Bill because I’d “gone off the deep end.” Although it hurt, I then had an intimacy with the Lord that overcame it all, and I could hear his specific instructions for me and his words of comfort. When Webb was about a year old the Lord told me that Webb’s condition would not consume his childhood. I’ve pondered that in my heart for all these years. Initially, I thought that meant that he would catch up and would walk and talk and be made whole here with us. What I came to realize was that it meant his condition wouldn’t consume his childhood with sicknesses and seizures and all those things that are par for the course with handicapped children. We only had thirteen years with him, but they were of robust play and laughter. He was eleven years old before he had his first cold, and that is certainly something to be thankful for. We minded the Lord by praying for and expecting Webb’s healing. That’s what the Lord commands us to do. I can’t be resentful that he chose not to answer our prayers the way we wanted him to. The Lord took Webb Wednesday morning without my permission! I'd already given him everything. And you know what? It was all already ordained from the foundation of the world. We’ve had miracles before with Sarah Grace’s heart defects that the doctors said couldn’t heal without an operation, and when George was diagnosed with polycystic kidneys. They said he could not live longer than a week! They were just babies and based on our faith they received their healings. But the Bible also says “according to your faith be it unto you.” Perhaps Webb was just unable to see his healing for himself and had a weak spot he couldn’t get past. I don’t know. I just know that the Lord says to pray and believe. And that’s what we do… because without faith it is impossible to please God. Wednesday night after Webb passed away, the children had the great idea that we all sleep together in the den. We held on to each other and prayed, and then one by one we fell asleep. I slept for a couple of hours but then woke up, and I just lay there looking over the room of my family who laid their lives down for Webb. Everyone knows that Webb’s daddy was his eyeballs. The night before Webb passed away, Bill lay on the floor for the longest time doing fireworks on Webb’s belly. And getting extra kisses before he put him to bed. And just so you know, Bill was Webb’s official toofer brusher and I’ll have you know Webb never had a cavity! As for the children’s part, it all started with Will coming to me when he was 10 when I was expecting John. He insisted that he take over changing and bathing and lifting Webb, as I was struggling with handling such a big boy. Once I delivered John, Will wouldn’t let me take it back over, assuring me that it was no big deal and that it was his pleasure. That freed me up to nurture my subsequent newborns, and I will always be grateful, Will. He kept those responsibilities until last August when he moved in with Momma to take care of her. And for all those years, he never once complained or copped an attitude. Not. One. Time. When he started Ma’s hospice care, Spencer and James then did a lovely job of sharing the responsibility of Webb. Sarah Grace poured on constant love and affection and made sure to take him on her walks around the farm to the pens to visit the animals. She was also Webb’s official cheek squeezer. For the other children, they all had their part whether it was finding his toys he was always losing, or fetching his wheelchair or sippy cup or baby wipes. They cut up his food and washed his face and found his DVDs and a multitude of chores. They played with him constantly. When he was little they used to tote him around in the wheelbarrow, in with the hay, to feed the animals. They pulled him around in the pool to his screams of delight. Their motto was always: He ain’t heavy; he’s my brother. And I never heard one single complaint. So while I looked around that room of sleeping Allens, I saw what Webb gave to us! Bill, we have children who gladly serve and yield to others. We have a beautiful, spiritual daughter and, of course, our holy boys. And even though we’ve had some unbelievably hard times here lately with H1N1, pneumonia, a month in intensive care, Daddy passing, Momma going into hospice and passing, you being out of work for a good chunk of last year, and now Webb’s passing, and I know your pain is heavy beyond belief… but even so, My George Bailey, I’d say you’re the richest man in Bedford Falls! I’d like to close with one of my favorite Webb stories. Sarah Grace and I wake up at 5am every morning to have our coffee and girl time. I’d noticed that when I was coming out of my room and passing the buckaroo room (we have a room with two sets of bunk beds) that Webb had just turned off the TV and was climbing back into bed. I became curious because it was happening every day. Finally, one morning I got up extra early and tip-toed down the hall to see what he was up to. I peeked around the corner… and Webb was sitting on the floor laughing his blooming head off at a Dr. Phil rerun! I don’t know if it was Dr. Phil’s bald head or folksy accent and manner (How’s that workin’ for ya? ), but Webb would laugh so hard that he would slap the floor and I even saw him fall over backward in hysterics. He was laughing so hard that he couldn’t get himself back upright. It was a contagious laugh, and I’d be in stitches watching him laughing at Dr. Phil. And when the credits would start rolling, he would turn off the TV and climb back into bed. We never knew how he originally found that show at 4am, or how he knew it was 4am to find it again each day, but that boy loved him some Dr. Phil. Many, many of my mornings were begun with his infectious laughter. And now the children would like to say a few words. Webb was a loving brother. When I was little I used to ride on his back. I was the first one to call him Bobo. Webb and I had a rich friendship. My dad called me his personal trainer. I played with him all the time. John, can you please come here so I can show them what I did with Webb? My brother Webb had the prettiest crystal blue eyes. He had the most handsome hair ever and the cutest freckles. 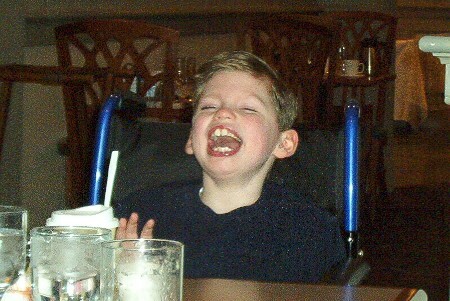 Although he was developmentally delayed, he had a great personality. I am so proud of what this family did for him, and what he did for us. Webb had the cutest gestures and the most beautiful smile. And he charmed everybody he met. Momma said there were puddles of nurses all over the hospital. Yesterday was very exciting because my dad, Bill Allen, was on NPR which is National Public Radio! If they play reruns you might could hear him. He was on a show about Patrick Henry College. He talked about Brown University, which is where he went to college. I felt so proud of him because he was so smart and the people kept saying he made good points. I don't really know what all they were talking about because it was big boy stuff. I said I would write about Webb this entry. Webb is nine years old and he is beautiful. He has very bright blue eyes and he has great freckles. His hair has a nice wave with some grey streaks. You may have noticed that we take Webb around in a wheelchair because he doesn't walk yet. He doesn't talk yet either but we lay hands on him and pray for him every day and we're trusting Jesus to heal him up. Some people don't believe that Jesus does that sort of thing but we know he does. He healed Sarah's heart defects up even though the doctors said they couldn't heal without an operation. George had medical problems. He had cysts on his kidneys and the doctors said he wouldn't live longer than one week old, but he is five years old now! We always give our worries to Jesus and that's why we're okay about Webb. We wish the Lord would hurry, but we don't give him a deadline or anything, we just keep on praying. Webb loves to play with loud toys. He likes rock and roll Ernie and he loves the Hess truck he got for Christmas. He loves all helicopters and the ceiling fans. In winter, he enjoys watching the fire in the fireplace. We used to feed Webb but one day Mom put the fork in his hand and told him to feed himself, and he has fed himself ever since! That was like a miracle because nobody would have thought he'd have enough sense to do it. It's hard to tell how much sense he has because he doesn't talk yet. One time his batteries ran out in his keyboard and Mom found him in the hall with a package of batteries and a Phillips head screwdriver trying to replace them. That takes sense, doesn't it? Will is the one who takes the most care of Webb. He changes his diapers and gets him in his chair and he gives him his bath. Will is Webb's best friend. Will usually knows what Webb wants. He understands Webb's sounds and he can just tell what Webb is thinking. Sometimes Will gets aggravated with Webb when he's being stubborn, but they love each other a lot. Webb is really fun to play with. Sometimes when we wrestle around, Webb will protect you from another brother. Sometimes Webb will let Richard ride on his back. Richard calls Webb "BoBo" because he can't say Webb. I think Blue's Clues is Webb's favorite show, but he laughs his head off at The Wiggles. We don't know all about what goes on in Webb but that's why Dad prays every day that the Lord would heal his lack, and then we thank the Lord for every new thing Webb does. One time Mom made strawberry shortcake for Webb because it is his favorite sweet thing. He doesn't like candy or cookies or ice cream. When he finished it up, he clearly said, "I want some more!" She made more and cried her head off. Jesus heals. It's not like a magic potion, it is just like trusting God to help because nothing is too hard for him. Webb gave the best hugs. Whenever I’d play with him, I would ask for one of his hugs. He would look at me with those flirty eyes of his, kind of give a cocked smile, and turn his head to play hard to get. Then he’d throw his head back and laugh, beam at me, put his arms around my neck and squeeze so tightly like he wanted to eat me up! Those hugs made my day. I’m going to miss them. It’s good seeing you all, I just wish we weren’t here today under these circumstances. And as I look at all of us gathered here, I can’t help but hope we’ll be together soon in happier times. As Webb’s primary caregiver, I forged a deep relationship with him that transcended words. When Mom was expecting John, I realized that Webb was too much for her to handle, since he was such a butterball when he was little. Over the years we developed a mutual understanding, to the point that I knew what he wanted just by the look on his face. Sometimes, if he was sitting beside me, he’d run his fingers up my back, grab my shoulder, and pull me backwards onto him. I’d look up to see him beaming. I always made sure to comb Webb’s hair to look exactly like mine. Or maybe it was the other way around. Lord knows I envied his perfectly wavy locks. Webb was also a sweetheart. Whenever a sibling would get a spanking, Webb would cry his eyes out for their sake. I know beyond a shadow of a doubt that Webb knew how much I loved him. I’ll cherish him in my memory for the rest of my days, and I look eagerly ahead to the day we’ll meet again. Heavenly Father, we thank you so much for Webb. You gave him to us for thirteen unforgettable years. And now he is with you. We know he is walking and talking, and happier than he has ever been. And we can’t wait to be with him again. We pray for the peace that passes all understanding that you give us through Jesus Christ our Lord and Savior. And we pray this in His name. Amen. Words are inadequate to describe the pain and grief that the family has experienced over the past three days since our wonderful son Webb passed away on Wednesday. Although our faith is sustaining us during this time, we terribly miss our incredible 13-year-old son and brother who has preceded the rest of us to heaven. For most of his thirteen years, Webb lived a fully engaged, robust, healthy life. 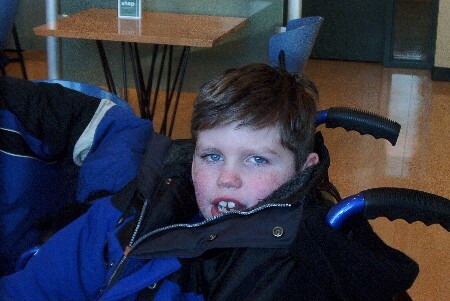 Although he never was able to walk or talk, he made up for this lack with an adorable personality, a hearty belly laugh, the most handsome blue eyes you’ve ever seen, and big rosy red cheeks that had to be kissed. Mandy knew from the day he was born that something with Webb was amiss. Initially, the doctors dismissed her concerns. But when it was clear that Mandy was right, the specialists did every test under the sun, and were only able to come to the conclusion that Webb was developmentally delayed. Ever since then, our family prayed for Webb’s healing every single day. Without fail. Our family’s life revolved around Webb, and we wouldn’t have had it any other way. With Webb not being able to care for himself in any way, every member of the family made sure his every need was met. And no one ever had a word of complaint, because loving and caring for Webb was what our family was all about. He was never ill, and was the picture of health up until a couple of years ago. We all have indelible memories of playing with him, and hearing his infectious laugh. Even though he couldn’t walk, he could crawl around the house like a bat outta hell. I had such great times with him chasing him down the hallway. We’ll never hear the tune from Blue’s Clues or Elmo’s World without thinking of how he loved to watch these shows. The boys had a ball wrestling with him and helping him play with his favorite toys. Even after his first seizure two years ago, he seemed to bounce back to his prior vigor. But after the series of four seizures in November and December of 2008, we could tell that Webb was not his former self. We almost lost Webb a couple of times when he was in the hospital with pneumonia last January. After that, he struggled to get back to his previous level of capability. Webb experienced another setback in August when he was in the hospital with a case of swine flu that worsened into pneumonia. We noticed that over that past number of months, Webb slowed down, and seemed to lose his former enthusiasm. We kept praying that Webb would bounce back, and then move on to where he could walk and talk. But God had other plans, and decided to take Webb sometime in the middle of Tuesday night. Webb was a blessing and a joy. We will think about him every day, and we will miss him until we see him again. No son or brother was ever more loved and adored. He was our darling, and he was beautiful. We thank the Lord for 13 wonderful years. We can't wait to hold him in our arms again. Click here to read a wonderful entry about Webb from John's journal. Click here to read Webb's obituary. Ma's house is on the market now, and today we had our first showing. We're praying for a good Jewish deal-- meaning that it's a good Jesus deal where both parties are satisfied. The order of the coyote howl clips has apparently been switched. Stupid Audiosparx. There are three sound clips entitled "Coyote Bark and Howl", but the right one is catalog number is 61296. Seriously, you gotta listen to what we're hearing in our woods.